Specially developed to clean ORCA® fabrics. 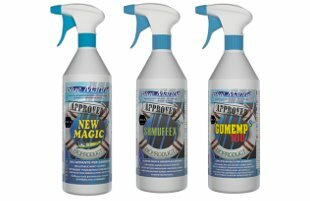 Discover our range of cleaning products. Step 1 - New Magic cleaning instructions : New Magic properties : Cleans and removes surface dirt. Use : New Magic is recommended for regular light-cleaning. If used more than on a regular bases, we recommend diluting with water. 1 - Spray New Magic onto a wet tube. 2 - Clean and scrub with a non abrasive sponge. 3 - Rinse with clean water. Shmuffex properties : Removes spots on the various layers of the fabric. Use : Apply Shmuffex immediately after completing step1. Protect elements surrounding the tube. Wear gloves and protective clothing when handling this product (contains chlorine). Check the expiration date of product before use (risk of loss of effectiveness). 1 - Spray Shmuffex generously, the using a non-abrasive sponge, spread over the whole surface of the tube. 2 - Let it set for 1 hour and make sure it doesn't dry out. 3 - Rinse with clean water. Repeat the process if necessary. Properties of Gumemp 100 : Protects the fabric against salt, atmospheric agents, and UV rays, by creating a surface film. Use : Gumemp 100 must be used after a regular cleaning (Step1) or deep cleaning (Step 1 + Step 2). It is strongly recommended to perform a deep cleaning of the tube before placing your inflatable boat into long-term storage. This product must be appied on a perfectly clean and dry surface. 1 - Spray Gunemp 100 on the tube surface and spread evenly with a clean cloth. Wait for the product to completely dry and then polish it with a clean dry cloth.